The host of the table is the "Voice Administrator" for that table, and will see a voice management menu at the right of the chat area when the table has been set up. 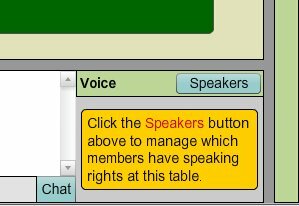 To select speakers for the table, the Voice Administrator clicks the "Speakers" button. The Voice Administrator will see a dialog box that allows them to add/remove authorized speakers from the table. 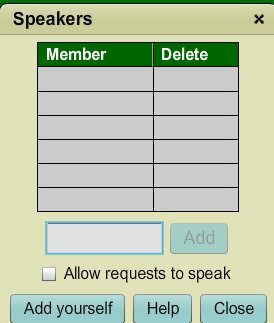 Note that there is a checkbox at the table that, if checked, will allow other users at the table to request permission to speak. The Voice Administrator can also right click on any user name (in chat for example), and enable/disable voice for that particular user name by clicking the desired command on the menu that appears. When a request to speak is made, the host will see a mini-popup in the lower right of his screen through which he can allow or deny permission to speak. This mini-popup will go away after about 10 seconds, auto-rejecting the application in the process, if the host ignores it. The Voice Administrator has a button for viewing the profile of the requester. A request to speak will not time out as long as the Voice Administrator holds his mouse over it. When a request to speak times out, the requester will get a message informing him of this. Speakers are also notified when their permission to speak is revoked by the Voice Administrator. Enemies of the table host who apply to speak will be auto-rejected. The Voice Administrator can hide/show the voice control through the menu that will appear by a right click in the chat area or in the voice control itself. This can only be done if there are no speakers enabled for the table in question. Once a Voice Administrator hides the voice control, the software will "remember" this setting. It is possible for the Voice Administrator to grant permission to speak to a user name that is logged in with the older downloaded Windows version of BBO, but that person will not actually be able to speak unless he/she logs off, logs in again with the new web version, and then joins the table in question. The Voice Administrator should always ask potential speakers which version of BBO they are using, if this is not already known. It will save time. For instructions on how to start speaking once the table is set up, click here.